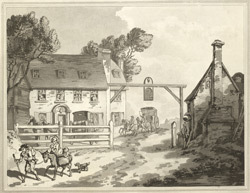 View by Rowlandson of an inn by the road in Sutton in Surrey. Sutton was an agricultural settlement throughout the Middle Ages. After 1755 turnpike road between Brighton and London was built, running through the village. As this picture shows, new inns and taverns were built to accommodate coaches and travellers between London and Brighton. The artist Thomas Rowlandson (1756- 1827) graduated from the Royal Academy before he was 16 years of age and opened a studio in Wardour Street in 1777, establishing himself as a watercolour portrait painter. In the 1780s he developed a reputation for cleverly capturing figures and scenes from Georgian contemporary life in a unique caricature style. He had a keen eye for satire and this came through in his work.